Center for Ankle and Foot Care Blogspot: Podiatry ICD-10 coding: The basics you need to know to be useful straight out of residency for billing!!! So you have just graduated from your podiatry residency, or you are wanting to seem more marketable after you are done your PSR-36. Remember, everyone you are competing against has completed a PSR-36 residency!! How do you make yourself stand a part from the rest? If you want to make yourself more marketable, know something about the codes that will make you money seeing and treating patients. Your future partner, or associate in a group, is a part of a business and you need to have an understanding of the ICD-10 codes in order to make money for them and yourself. Since October 2015, when the shift to ICD-10 took place we implemented our new ICD-10 Superbill or Encounter form. We have been extremely successful and continuing to treat patients and bill without having any interruption of payment for services. As we are approaching the one year anniversary of using this form we wanted to offer a reference form, at a small cost to you, to help you acclimate to the business/doctor world out of the ivory tower of academia. As a podiatrist, you know you have to be a little more scrappy than the other specialties. We know modifiers, as we have the craziest modifiers and are a modifier specialty in our procedure codes. So you should not fear the new diagnosis codes that are followed by: A D G S for the trauma fracture codes for example. But at the end of the day, what you need to make sure you know how to bill inside and out is your most common diagnosis with your most common procedures. Sure I see trauma, but I see a lot of plantar fasciitis, posterior tibial tendonitis, peroneal tendonitis, ankle sprains, ulcers and diabetic foot care. I will tell you that these are clear and very straightforward for the most part in ICD10. We are all in this together and should not be overwhelmed by the bean counters. In my own practice, I can tell you that my world did not come crumbling down when the ICD-10 codes took over, and claims from all payers are coming in the normal standard fashion. All of my at risk foot care or diabetic foot care claims have all been clean with no problems. Normal every day tendon injuries like peroneal tendonitis, Achilles tendonitis, posterior tibial tendonitis and plantar fasciitis claims are going through as well with no problems. I hope this helps makes your life a little easier in the ICD-10 new world of billing. I know in my practice I see a lot of diabetic wounds so I was happy to see these codes were not terribly convoluted. If you do not have a "superbill" we have a quick reference sheet, for what we see as podiatrist most common diagnosis, available at our website. It seems as though the ingrown toenail codes that are billable to the highest level of specificity right now are for the right and left great toenails. I guess this is not that big of a deal, considering most of the ingrown toenails are usually the big toenails. The old code for ingrown toenail was 703.0 is now L60.0 there is no laterality with this code but I would use this code with the other ones suggested next. The old code for paronychia or infected ingrown nail was 681.11. The new ICD-10 code has laterality but only for the great toes. Right great toe infected ingrown toe nail is L03.031 and left is L03.032. So if you are billing a 11730 or a 11750 the modifier for the toe should still be used on the CPT code. M79.609 which is just pain in limb this is the unspecified pain in limb because there is no pain in limb in foot or toes specific. This is pretty straightforward information, so far as it looks in the new world of ICD-10. Again, in our practice, this is a procedure that we perform several times throughout the day. I suggest knowing what you do every day inside out. If you have a good EMR you will be able to look up the specific code translation from ICD9 to ICD10, and there are so many nice resources available on the web for your reference for the "zebras" that walk into your office. Remember, know your codes for plantar fasciitis/heel pain, diabetic foot care, ingrown nails, and the other most common patients you see a day. There is a lot of transparency in what we do, but in a good way. Many people come to us for very simple problems and we have simple answers to help them in usually a very cost effective way. This is an easy one, you just need to know the new ICD-10 code from the old ICD-9 code. The plantar fasciitis, much to my surprise, does not have laterality. So the old plantar fasciitis ICD-9 code was 728.71 and now is M72.2. I'm guessing that when ICD-11 hits this will change, but for now it is a pretty simple and straightforward conversion. M77.31 Heel spur right calcaneus(if on x-ray there is a spur and you dictate it, I would recommend this code as well.) Being as specific as possible is going to be very important in ICD-10. The M77.31 specifies laterally for right side and the code for left heel spur is M77.32. 99203 If you have documented well and spent the appropriate amount of time with the patient you have a new patient encounter of this level. 73630 R If you are taking X-rays in office to rule out stress fracture or evaluate possible heel spur, this is the 3 views of the foot with the appropriate right sided modifier. 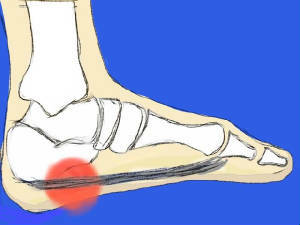 But this is where we see our laterally with plantar fasciitis in the x-rays. Great and well-written post. Really very useful for medical billing coders. Thanks for sharing the post..